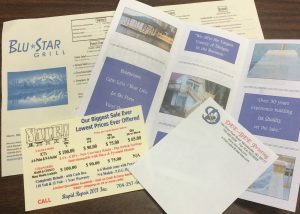 Our cheap color copies are printed on our discount color printer. It is a very large commercial inkjet color printer. It can print at very high speeds in color and on both sides of the paper. We use this printer a lot for low cost color flyers, color note pads, posters etc. The cost is less than ½ of the cost of our color laser printer but you still get color copies. The cost of your copies on this printer will depend on several factors. Quantity, The more you get the less the cost. Paper, Basic copy paper is included but we have a large selection of optional papers. Size, We can print on small envelopes and paper up to 12″ X 18″.